Flipkart is selling Targus TBR003US-72 15.6-inch Rolling Laptop Case (Black) Rs.887 only which is worth for Rs 4350 at lowest and best price online.You can follow the below steps to buy this product at their deal price.Keep Visiting dealsheaven.in for more Best offers ,hot online deals, promo code, coupons and discount . Designed to fit a range of laptops with screens up to 16" in size, including models with an extended battery. Works as a protective slip case and also a portable lapdesk. 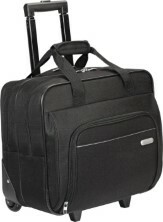 How to buy Targus 15.6 inch Rolling Laptop Case?